The highly acclaimed journalist Ms BK Sidhu, who has just being promoted as the new Editor of StarBiz, had quoted an unknown source that the AirASIA X IPO SHARE will be over-subscribed by 3 to 4 times which later turned out to be FALSE. Maybank Investment Bhd, whose CEO is YM Tengku Zafrul Aziz, had to pumped in RM39.688 million to stabilise AirAsia X IPO share price of RM1.25, in HERE. Left: Datuk Nazir Tun Abdul Razak (CEO of CIMB), Tan Sri Tony Fernandes (AirAsia Group CEO) and YB Dato’ Seri Idris Jala, the learned Minister, with the thump up sign. “Idris was appointed CEO of the national carrier on Dec 1, 2005 to steer the company out of turbulence. MAS posted 10 consecutive quarterly profits during his tenure as the CEO between 2006 and 2008.” Yours truly isn’t sure whether the disposal of prime properties of MAS in Malaysia (Menara MAS in Jalan Sultan Ismail), London and other countries during his tenure as CEO of MAS was one of the main contributors to the said 10 consecutive profits posted then. “that the Government should play the role of a facilitator to businesses rather than have direct involvement or ownership” “He would not buy MAS.” The said full adverse article is in HERE. soon after the MAS-AirAsia share swap was reversed, Tan Sri Tony Fernandes had said that AirAsia will not send its aircraft to MAS Engineering for maintenance but in June 2013 AirAsia started to send its aircraft to MAS Engineering for maintenance HERE; and etc. To that highly acclaimed journalist, the above facts were not relevant to her as far as “professional balance reporting” is concerned and to Tan Sri Tony Fernandes the above were how Tun Adbullah administration was acting as a “facilitator” to AirAsia’s business model. It would be most fitting if the Tun Abdullah Administration was running the country with the slogan “Now Everyone Can Start A Low Airline With Government Help”. By the way Tun Abdullah Badawi was appointed Adviser to MAS a few weeks before the infamous MAS-AirAsia share swap and he must have been advising MAS on its numerous Business Plans . To the credit of the Minister, YB Dato’ Seri Idris Jala, after he uttered the above damning statement MAS in the Tuesday (13-8-2013) morning, he had rush a statement out on Tuesday night (13-8-2013) to say amongst other things that the Government had no intention to sell MAS. Please do not misconstrued the Minister’s evening statement as damage control. 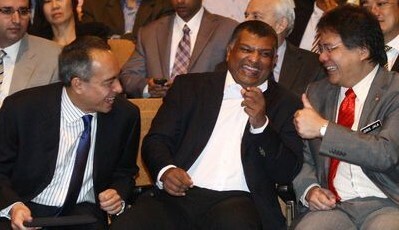 As a Minister in charge of NKRA and KPI, he has the reputation of not “shooting from his hip”. In May 2010, he had warned the nation that if the Government does not cut subsidy, the country will go bankrupt by 2019, in HERE. Yours truly wasn’t sure whether or not a subsequent statement was rushed out to the press. The AJ’s said email is reproduced in verbatim below. With the paying of top money for the special “Tracking Programe” , which may be part of the grand Business Plan of AJ, to track the flow of information including emails, the top management will definitely be able to discover how the the said email was out in public domain. Most probably, the witch hunt within MAS will begin in full swing soon. How we wish the top management of MAS will go all out to find ways and means to review the lope sided 25 years catering contract involving LSG Sky Chef’s Brahim Sdn Bhd, a company controlled by Tun Abdullah Badawi’s brother (Datuk Hj Ibrahim bin Badawi). Yours truly is quite sure that Tun Abdullah Badawi, as the very learned Adviser of MAS and fully alert, he would have been advising the top management of MAS to find ways and means to termiante the one sided catering contract as it is a yearly financial burden to MAS for 25 years and the inflight foods can not match other airline like Emirate, SIA and others. But it would appear that the top management of MAS is sleeping over the matter. Yours truly is sorry for a little bit of digression for the sake of completeness. By now, many of you would have read the news reports today that referred to supposed comments by YB Senator Dato’ Seri Idris Jala on the Government’s involvement in the airline business and that MAS should not be sold at a loss. Also reported is YB Dato’ Seri Idris’ clarification, made soon after, that the Government does not have any plans to sell MAS. I believe the media took his comments on selling MAS out of context. More importantly, I want to assure you, my fellow colleagues and team mates, that we have to rise above all of this noise and keep focused on our Business Plan to strengthen Malaysia Airlines. We have made much progress to-date since end of 2011 and still have lots to do. Do not let the noise distract us from our work and ‘journey’ to turnaround Malaysia Airlines, for our guests, our Nation, and ourselves. I am encouraged by a note that YB Dato’ Seri Idris wrote to me today in which he again clarified the actual context, situation and his comments made yesterday. Unfortunately, an important lesson was learned – that some people, either deliberately or genuinely, confuse scenario discussions with actual plans going forward. It is also important for you to know that we continue to have the full backing and strong support from our major shareholder, Khazanah Nasional Berhad, for our Business Plan and initiatives to turnaround Malaysia Airlines. Whilst we are still not yet out of the woods, our financial and operational performance is significantly better than 18 months ago. This is shown in our improving uptrend in monthly statistics, as I wrote to you on the June numbers recently. This is an important fact, and the strongest motivation that WE – you and I – as a team, can and will make this Business Plan work. We have had detractors in the past, now, and possibly in the future. But let the results speaks for themselves and how our Company is improving. Stay focused. Stay strong. Stay together. When AJ took over as Group CEO of MAS, he had promised to turn around MAS during his contractual period. MAS share is currently hovering around 31-34 Sen. By the way AJ tenure as Group CEO of MAS will expire in September 2013. BK Sidhu is just a promoter of AirAsia and TF. Therefore, it is expected of her to write negative stories about MAS. She has been doing it all the time. More importantly is who is heading MAS after September after AJ packs his bag. He is no good for MAS. He is too close to TF for comfort. The Pariah will say anything for expediency sake and to make him looks good. a few weeks or months he will do otherwise and he knows that public memory is short. He can always sent AA aircraft for maintenance because he had the Botak in the MAS Engineering and AJ, the budak suruhan, as the CEO. He has also Nazir Razak to smooth his way with PM. Thank you YB for reminding us that AJ’s term is up in September. This is the best news for MAS. We hope that PM knows by now that AJ is the worst CEO of all times. He is clueless and a budak suruhan to the Pariah. Once he goes the Botak will follow suit. Remember AJ was the one who brought in Al Ishal to head Marketing and Promotion and after having done the damage he left to join AirAsia. Going by the trend, if AJ term is not renewed then he will also join AirAsia. I hope that the PM will not renew his term for the sake of MAS. Yup, and how much has MAS racked up in losses over the years? How many restructurings and bailouts did it go through? How many times did it dip into public funds to keep itself going? Come to think of it, MAS was sold before, wasn’t it? To a certain Tajudin Ramli, if memory serves me right? What happened to that particular exercise in privatisation? Of course, all this happened before Tony Fernandes appeared on the horizon. So, who are you gonna blame, huh? 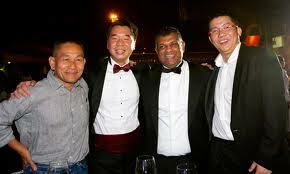 AJ as MAS CEO knowingly gave away the profitable Sydney route to AirAsia X. What have you got to say AJ. Was this how you look after the interest of MAS? Charging AirAsia X below market fare to ferry 50,000 AirAsia X passengers when AirAsia X stop its London, Paris , Mumbai routes because it was loosing money. That brainless or he knew what he was doing to help his good friend Tony. The Government must re-look at the salaries paid to the top management. Whether it is worth the money paid to them. AJ is drawing at least RM200,000 per month. TS Md Nor may be a bit less. The Botak must be paid a sum that he could never dream of in Airasia plus all the perks. These are the over paid idiots in MAS. The Gaji Buta lots. gajibuta is right abt AJ..infact Aj assigned his own consultant as proxy to be seen doing some changes. Staff are going to be sacked especially the graded staff so to protect the operational staff that is currently overstaffed. Zahrah zaid cannot functioned on daily basis bcos she is diabetes…always unavailable for instant decision making. Heard she’s begging to stay but she’s eilling to sell out Aj and the botak. Capital injection of RM 3.67 billions in 2007. With reference to MAS 5 year financial performance ended 2007, there was a huge increase in Cash & Bank balances in 2007 in excess of 3.67 billion as compared to 2006. As at Dec 31, 2007, MAS had RM 5.25 billion in cash and bank balance and as at Dec 31, 2008, MAS had a cashpile of RM3.57bil. Where has the RM 1.68 billion gone to ???? Another blogger, SatD, the first to raised the issue following the newsportal report also pointed that Idris must be able to differentiate between development expenditure and operating expenditure of the government. “What you are saying is misleading and reckless for someone of your position…..you give the impression that our Government does not have any financial discipline and does not adhere to the Law as provided for by the Constitution and its guidelines,” he wrote, criticising Idris for his statement (as reported by the news portal). “Yelah, Tony F also do not know the difference between OPEX and CAPEX. 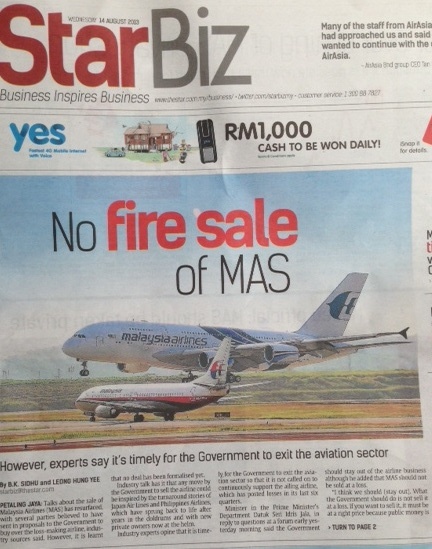 Today, TDM says that MAS shd b sold. Wasn’t it this same clown who sold MAS to TR who raped MAS and ran it to the ground. MAS never recovered from the damage done. The very best airlines in the world hire the best and yet they still struggle to keep airlines consistently profitable. Here in Malaysia, the politicians think that with their incompetent minions and their meddling, MAS can accidentally turn around and become world class. This is the biggest screw up in MAS. MAS need to hire the best talent so it can be well managed in one of the most complex businesses. Go back to MAS origin and see how at that time they hired the best regardless of race and made MAS what it was. Today, I guess it is like another govt department. Hire the BEST to run this once upon a time “Pride of the Nation”. There is no other option!!! The best cannot be the Old Sentimental Fools who think they can do it now with the industry Very Different from the good old days when there were no emirates,etihad .qatar etc …The oldies had the goverment behind them , ..therefore what they ran was not business but a goverment department. That was the history that set MAS to be what it is today.The culture was set then and it still continues till today..What MAS need is a new mindset of the management lagards of yesteryears and staff who still think the goverment will bail MAS everytime it sink. But of course the goverment interference also did the damage.MAS is a cash cow for everybody.So who to blame.Now with the industry so competitive nobody can make MAS make money. NOBODY…be it with the goverment or with a privatised entity.So cut the crap..just continue with the current team to do what they are doing to cut the costs and losses in spite of all the games the goverment play.